I loved The Commitments and recently re-watched Quadrophenia and The Last Waltz. Any other favorites? Pink Floyd The Wall, is great. Saw it first in my early teens and liked it, saw it in my early twenties, and understood it. Sublime1's avatar reminds me of a classic: The Blues Brothers! Sublime1: YES! YES! JESUS H. TAP-DANCING CHRIST... I HAVE SEEN THE LIGHT! I can't believe that didn't even occur to me until you posted it! Love all those, C.J. Let's not forget The Phantom of the Opera. Yes, of course, that was a brilliant movie as well. 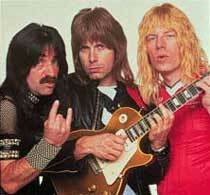 Haven't seen Spinal Tap, sublime, but I see it did for rock and roll what The Sound of Music did for the hills. Thanks, sublime. Sounds hilarious. I'll have to check that out, Chi. Now I'm off to watch Monk. Nite, all. Airheads (incidentally costarring Fred McKean from Spinal Tap) was a surprisingly entertaining movie. Jessica Lange as Patsy Cline in "Sweet Dreams". "Gypsy" and "The Unsinkable Molly Brown".